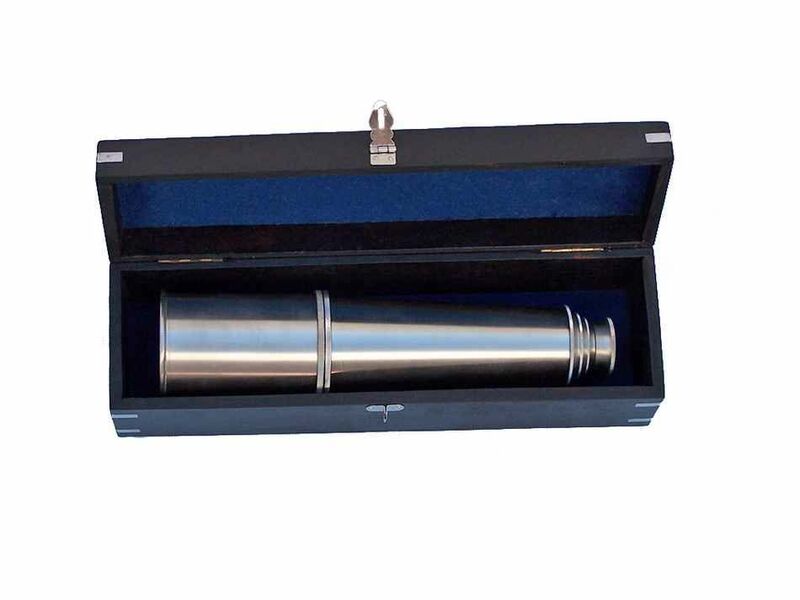 The Deluxe Class Brushed Nickel Spyglass with Black Rosewood Box 36" is the top of the line hand held telescope and will fit splendidly into your nautical home. The spy glass measures 36" when its five nickel tubes are fully extended. The spy glass is 9" when collapsed. Simply adjust the telescope tube length to bring image into clear focus. The 36" spy glass is shipped in a beautiful felt-lined chrome-inlaid hardwood case. 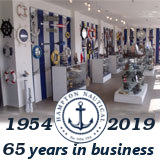 The box is hand-painted black and features chrome side inlets on all sides along with the Hampton Nautical solid chrome anchor-with-rope logo on the top of the box. The box is smooth finished hardwood, gloss finished, measuring 9.5" wide with a solid chrome clasp in front.